It takes a certain amount of flair to make a movie about the movies work for stage – but Jonathan Church’s slick production does all that and then some. Telling the tale of the arrival of the talkies in 1920s Hollywood, the inclusion of overly histrionic (and extremely funny) black-and-white film sequences works surprisingly well, enhancing rather than detracting from the live-action on-stage. 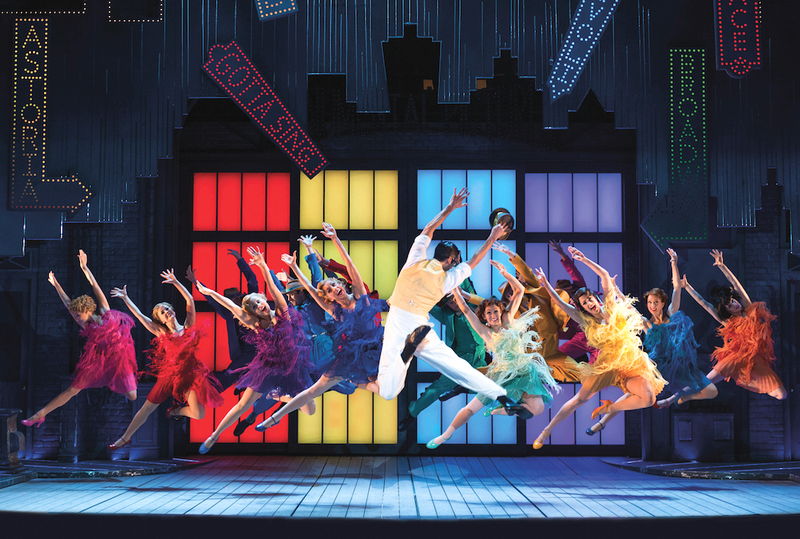 The musical numbers have also been beefed up for stage, but in considerable style thanks to Andrew Wright’s inventive and exhilarating choreography. The frenetic tap exuberance of Moses Supposes is one highlight, the epic explosive vibrancy of Broadway Melody another (even if it makes as little sense to the plot here as it did in the film). I particularly loved the staging of the latter number, with a rainbow of neon signs and flapper dresses, thrillingly breakneck dancing from the whole company, and a sultry knockout performance from Mila De Biaggi in the Cyd Charisse role that left me almost as breathless as the hotfooting cast themselves. Elsewhere, comedy number Make ‘Em Laugh boasts a wonderfully elaborate series of new sight gags; even without Donald O’Connor’s iconic running-up-the-wall somersaults, I never wanted it to end, just to see what else Wright could come up with. However, Good Morning, one of my favourite numbers in the movie, does suffer in comparison; in the film, it’s a standout, but on-stage and uprooted to a park bench, it just doesn’t feel quite as special, missing the raincoats, bar and sofa elements that gave the original such charm. Gene Kelly is a hard act to follow and whilst Duane Alexander as Don Lockwood doesn’t technically put a foot wrong, he lacks a certain charisma in the role – allowing Steven Van Wyk as his comical sidekick Cosmo to shine, capitalising on every quick quip the script gives him. Bethany Dickson brings an earnest apple-pie sweetness to Kathy Seldon, much as Debbie Reynolds did, but it’s Taryn-Lee Hudson as diva Lina Lamont who really steals the show. Jean Hagen showed in the film what a gift of a part it is, and Hudson pushes it to hilariously screechy new highs. 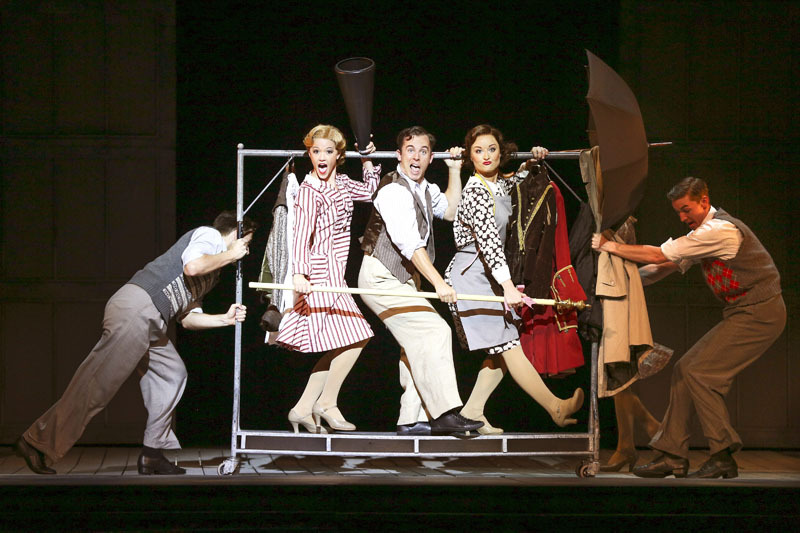 Other than a couple of sound problems that I’m sure will be ironed out for the rest of its Hong Kong run, my main issue with Singin’ In The Rain is a problem with its stage adaptation rather than the production itself. The show feels rather top-heavy, with a too-long first act that packs in all the most famous numbers with little breathing space, leaving a too-short second act that’s almost anticlimactic as a result. Much of that, however, is due to having to place the show’s most iconic number right before the interval… and for that, I’ll excuse it anything because the spectacular staging of the title song is sublime. 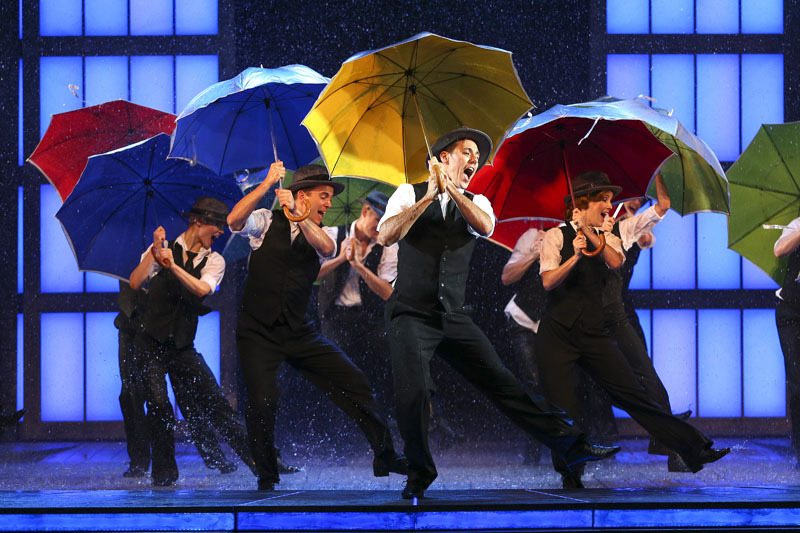 Complete with an onstage deluge of water that also soaks members of the audience, Singin’ In The Rain is five or so minutes of pure unadulterated joy. I could watch it every day of the week and twice on Sundays and never be bored… and thankfully you get to relive it all over again with the entire umbrella-twirling cast at the end. It’s an effervescent transcendent pleasure that would light up even a Typhoon No. 8 kind of day. 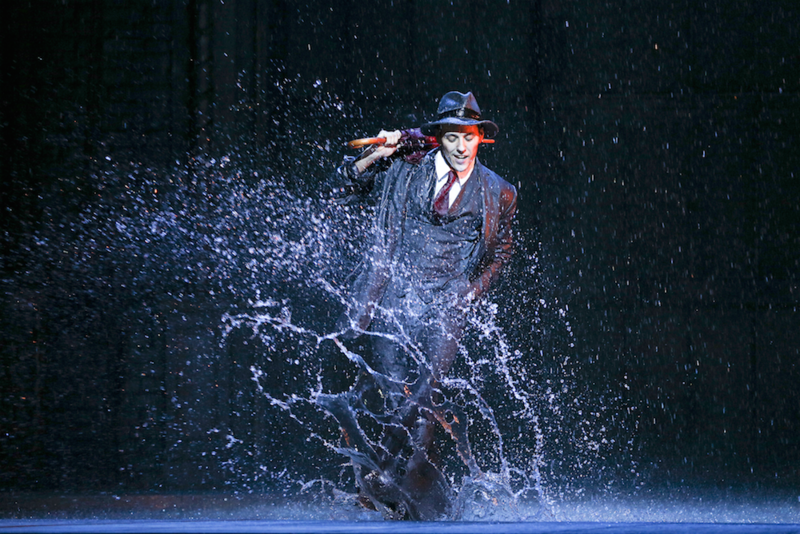 For sheer joie de vivre, Singin’ In The Rain can’t be beat – and this stage production is no exception. I promise you’ll be humming the title tune for days… What a glorious feeling, indeed. Singin’ In The Rain by Lunchbox Productions is at the Lyric Theatre, Hong Kong Academy Of Performing Arts, 25 September-25 October 2015. 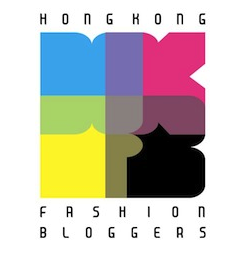 Tickets cost $445-995 and are available from www.hkticketing.com.hk. This entry was posted in Culture, Hong Kong, Theatre and tagged Andrew Wright, best musical, Bethany Dickson, Chicester Festival, Duane Alexander, HKAPA, Hong Kong Academy of Performing Arts, Jonathan Church, Lunchbox Productions, Mila De Biaggi, musical theatre, review, Singin' In The Rain, Singin' In The Rain HK, Singin' In the Rain Hong Kong, Singing In The Rain Hong Kong, Steven Van Wyk, Taryn Lee-Hudson, theatre. Bookmark the permalink.